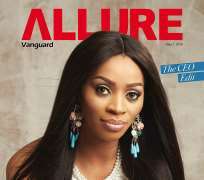 SAN FRANCISCO, April 30 (THEWILL) – Billionaire wife and entrepreneur Shade Okoya looks stunning as she graces Vanguard Allure cover. She speaks on the new innovations at Eleganza, and her life with her billionaire husband, Chief Razak Okoya. The magazine comes out tomorrow Sunday.